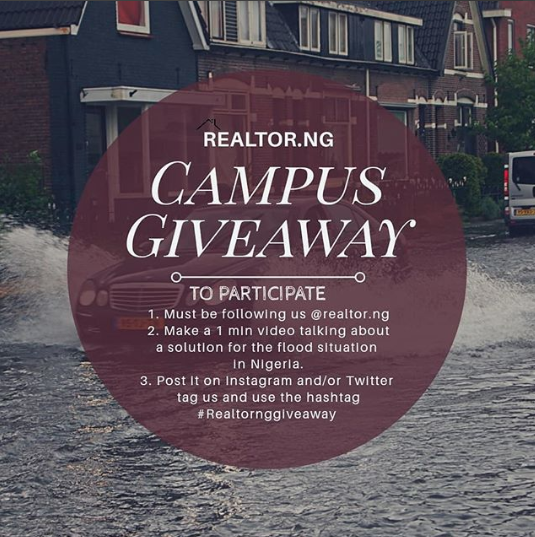 Win N100k in Realtor Nigeria Campus Giveaway. We’re doing a general 100k giveaway for Nigerian students. The campaign is centered on Flood problems in Nigeria. 1. Every student participating is required to make a minute video telling the public (Nigeria), a solution to Flood problems in Nigeria. 3. You must be following at realtor.ng #realtornggiveaway. 4. Winners would be selected by votes on Twitter. This test is to see what school can produce the brightest solutions and eventually come out top, we are quite aware that your school has the capacity to win so we want our give your school an opportunity to do this. More info in the poster below. Kindly share this on your timeline and insta-story to students of your school.